Sadly, many people still don´t take seriously the extent to which furniture, design and architecture can enhance the experience of living, providing friendly, pleasant, well-lit and organized spaces. 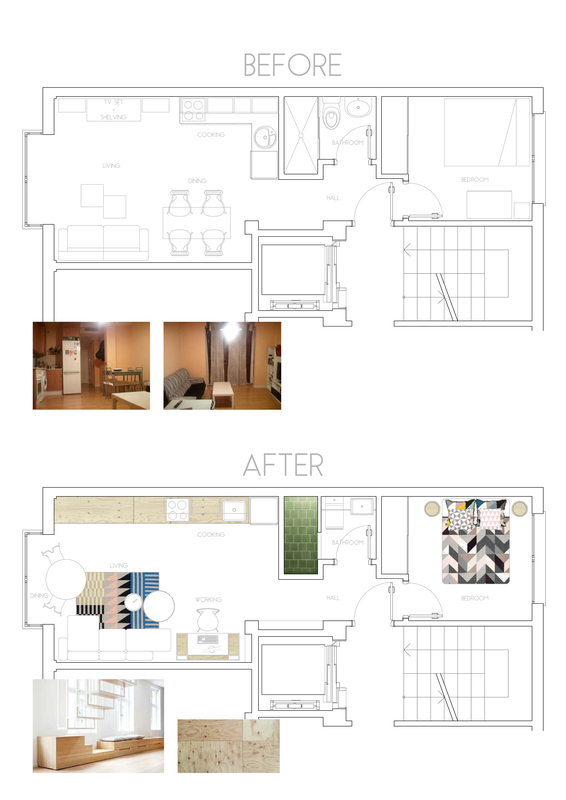 The apartment whose floor plan is shown below makes me think about that every time I stay there. 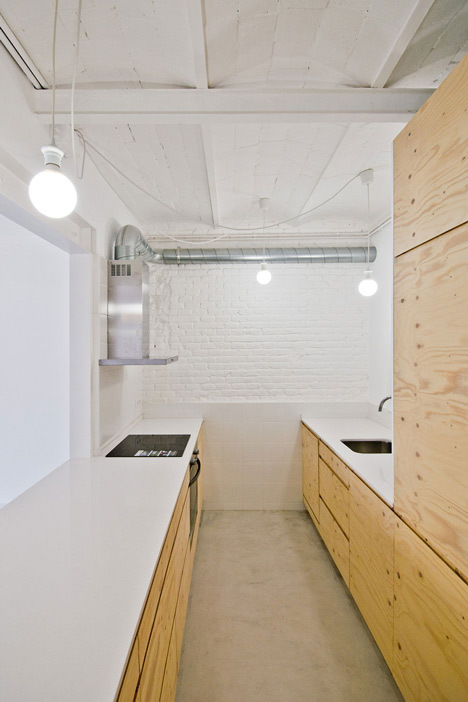 It is a one-bedroom flat located in a working-class quarter in Madrid and it is a good example of the poor quality architecture built during the years prior to the collapse of the Spanish real estate bubble in 2008. 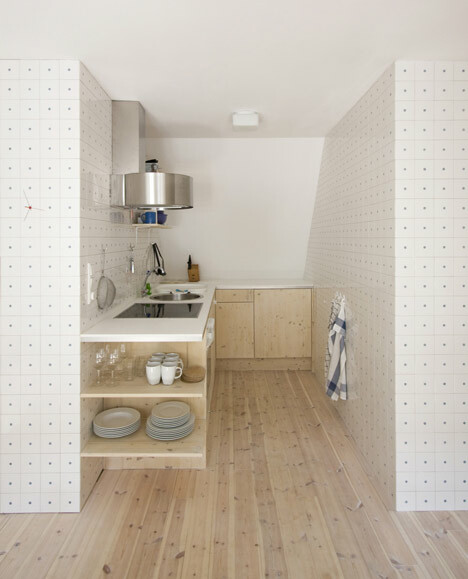 The floor plan – with its chaotic partition walls – gives us an idea of the dispassionate, careless layout. The furniture chosen by the owner does not help; neither does the colour on the walls: the black & white furniture against a peach-coloured backdrop is utterly disagreeable and aggressive. So, here it is my attempt to improve it: first of all, pristine white walls and light-coloured pine floorboards throughout the apartment. 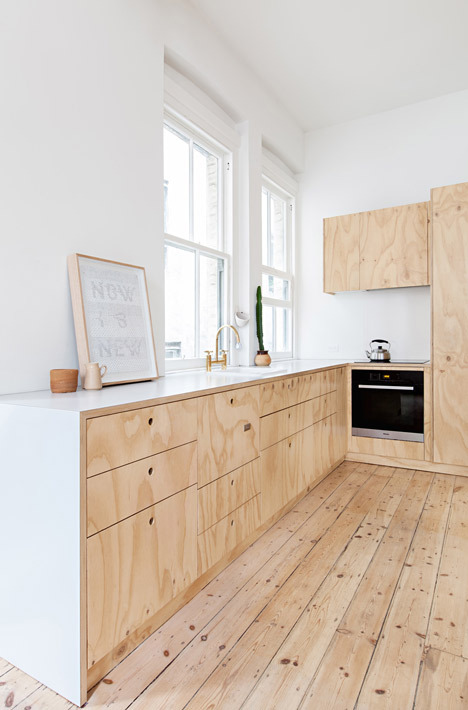 Secondly, I would move the L-shape kitchen, which is lengthening the corridor, to a plywood structure that would take up the longest wall of the room. 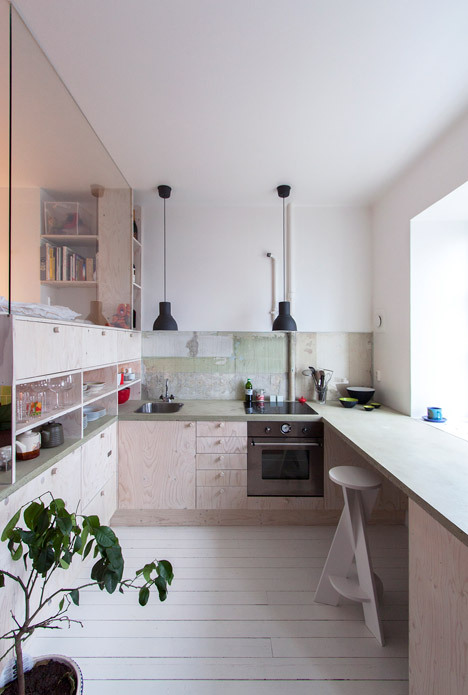 At one point, the kitchen counter would drop its level shaping a bench/shelving with storage underneath. Thirdly, a working area would be added next to the hallway and a round dining table would take up the space around the floor-to-ceiling bay window. Last but not least, a pick of furniture, lighting, prints and rugs would add dynamism to the neutral, airy and relaxed background. 1. ARRANGEMENT Print by Emma Lawrenson at Etsy. 2. CUPERTINO DESK & Ottawa Chair from BoConcept. 3. DON´T LEAVE ME (DLM) by Thomas Bentzen for HAY. 4. AROUND COFFEE TABLE by Thomas Bentzen for Muuto. 5. FOLK RUG by Sylvain Willenz for Chevalier Edition (FR). 6. WOOD LAMP by TAF Architects for Muuto. 7. MAGS SOFT SOFA from HAY. 8. VERTIGO LAMPS by Constance Guisset for Petite Friture. 9. 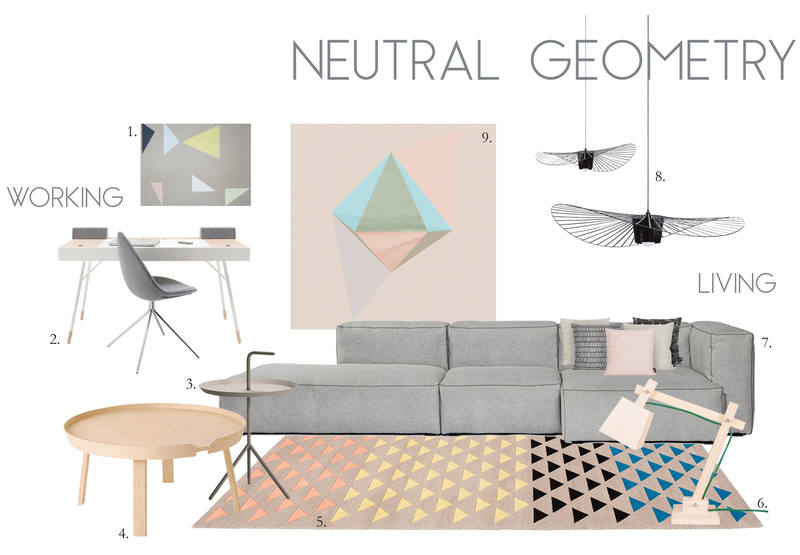 PENTAGONAL DIPYRAMID Print by Natalie Nicklin at Society6. 1. VERTIGO LAMPS by Constance Guisset for Petite Friture. 2. HYVE MODULAR SYSTEM from Herbst Produkt. 3. FOLK RUG by Sylvain Willenz for Chevalier Edition (FR). 4. 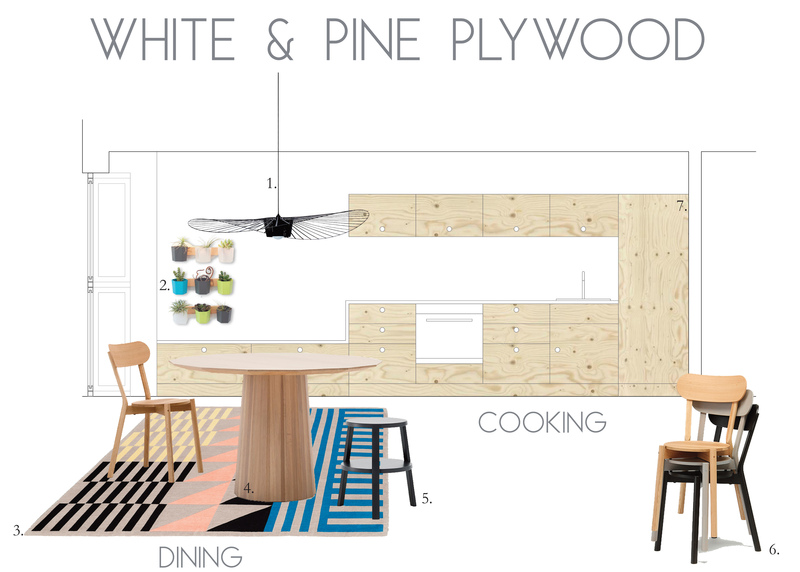 COLOUR WOOD PLAIN DINING TABLE by Scholten & Baijings for Karimoku New Standard. 5. STOOLS by Teruhiro Yanagihara for Karimoku New Standard. 6. CASTOR CHAIRS by BIG-GAME for Karimoku New Standard.